This healthy version of a Starbucks favorite combines the rich, decadent flavors of chocolate and coffee with a hint of sweet and salty caramel. 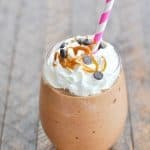 Low calorie, low sugar, and high protein, my Salted Caramel Mocha Protein Shake is the perfect on-the-go healthy breakfast! Add all ingredients to blender and combine! Garnish with whipped topping and salted caramel syrup, if desired. For purposes of calculating nutrition information, I used my favorite IdealLean Chocolate Brownie Protein Powder (which has 80 calories per scoop). You can substitute with a different protein powder, but the nutrition information may vary. Nutrition information does not include optional toppings. If you’re preparing this healthy smoothie for kids, you can omit the protein powder and substitute with Greek yogurt. Since the protein powder adds not only thickness, but also flavor to the smoothie, you’ll want to use a sweetened vanilla Greek yogurt or use a plain Greek yogurt and add your own sweetener, to taste. You will also need an additional 1 tablespoon of cocoa powder for that chocolate taste. The taste and texture of the smoothie recipe with yogurt will not be quite the same as the protein powder version, but your family will still love it! Keep the healthy smoothie recipe low sugar by using unsweetened vanilla almond milk and a sugar free protein powder. I prefer whey protein for flavor and thickness in this smoothie, but if you prefer a plant-based breakfast, you can substitute with a vegan protein powder. You can find caramel extract in the baking aisle of most grocery stores (near the vanilla extract) or online here. Don't skip this ingredient -- it MAKES the shake!